I have a 10” Vortalex desk fan Cat. FM10V41 which from info on the site is from 1949. I need to find a source for an oil cup, spring and wick. Somewhere along the way the cup went missing. I hope that better oiling will fix it but there might also be a problem with the bearing. At low speed there is a rumble. Any help from the forum would be appreciated. I'd check with antiquefanparts.com, or Darryl Hudson Machining. Both are members here. David that's a great thought but I believe that particular Oiler Came from a 1950s Vortalex as the late 1940s Vortalexes used Brass Oilers, so it wouldn't look right on the OP's fan with it having brass hardware on it. Cosmetics aren’t an issue with me. I need a quiet functioning fan. Most of the pre 50s Vortys I have don’t have brass oilers. I have one that does, a 9” pedestal from 1938. I haven’t had the opportunity to compare sizes between them other than eyeing them just now. They all look the same to me although I don’t have any of the larger vortalexes. My 1948 Vortalex a 12" model (Bronze body with Tan Blades) has a single Brass Oiler on the front of the fan and the Oscillator engagement knob and all of the fastener screws that hold the fan motor housing and oscillator housing lid and the base cover on are all brass on my fan, and as far as I know they're all orignal to the fan. The reason why I said something was because I didn't know if possibly there was a size difference between the fans with the brass oilers and ones with the chrome oilers and between the different model years and the different size fans. I would think that the 10" Vorty would have a somewhat smaller oil cup than the 12" and 16" ones. All my fans of that type have found other homes so I can't check directly but do see if you can learn if the 10 fan uses a different sized oil cup. the 8-9" fans do use a much smaller oil cup and the 10" has a much smaller motor than the 12 and 16". David Kilnapp wrote: Rick: The oil cup below came off of a 16 inch vortalex and may fit the bill for you. Steve Stephens wrote: I would think that the 10" Vorty would have a somewhat smaller oil cup than the 12" and 16" ones. All my fans of that type have found other homes so I can't check directly but do see if you can learn if the 10 fan uses a different sized oil cup. the 8-9" fans do use a much smaller oil cup and the 10" has a much smaller motor than the 12 and 16". That's the other thing I was thinking of too, was whether or not the smaller fans used a smaller oil cup than the bigger ones because of having smaller motors. 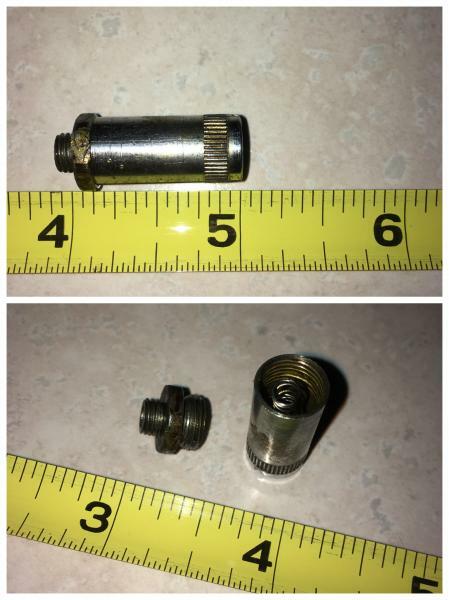 What is the diameter at the threads? It might be too big. The hole on mine looks like maybe 1/4” or 3/16”. Hard to see as it is mounted at this time. I believe the 10” vortys have the 2 piece oil cup. The small reducer that threads into the bearing holder, then the small oil cup. The wicks are smaller than 1/8” and I’ve not found a source for wicks that fit the smaller GEs. I’ve used zippo lighter wicks in a pinch but they’re not optimal in my opinion. Lane Shirey wrote: I believe the 10” vortys have the 2 piece oil cup. The small reducer that threads into the bearing holder, then the small oil cup. The wicks are smaller than 1/8” and I’ve not found a source for wicks that fit the smaller GEs. Yes, here’s a two piece off one of my 10” Vortys as Lane describes. This is off a first generation. Well, fellas I'll ship it off to Rick and he can try it to see if it fits. I would prefer to have something that was original to the fan but that's not my call in this case. In any event, it its the wrong one, the cost of mailing is trivial and no one is worse off. Others have done me similar favors (Sidney Lamb and Dennis LeBow for example) so I'm obligated. Thanks. I’ll try to find something to make the transition. Not sure what I’ll be able to find. It would be great to find the right Oiler. I’ll keep looking but here was my best chance I think. Antique fan parts has a good selection but I didn’t see an exact fit. Didn’t find Darryl’s site yet but will keep looking. You might reach out to him to see if he has something to match your needs ifthe one from Dave doesn’t work. Looks like no threads on the oiler hole. Stripped? Never there? I don’t understand how the Oiler works. Is there enough capillary action to oil the sleeve bearing? I guess I was expecting a hole thru the sleeve that the shaft would be visible, but the sleeve bearing is continuous. I guess I could push the sleeve bearing out and tap the hole, but I will probably ruin the rubber holder. Little reluctant to do that. I am kind of leaning towards just packing that front bearing with grease and see how long that lasts. Tim Marks at White Glove Fans makes new brass bearing holders to replace the pot metal ones like you pictured. 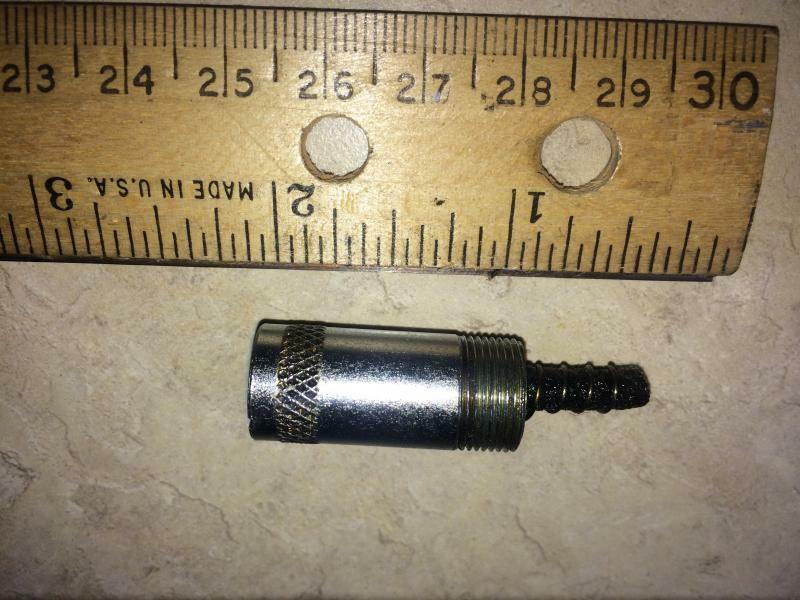 Apparently the threads holing the oil cup adapter were stripped and that’s likely the reason for the missing cup. Those threads are easily stripped. Rick Elder wrote: I don’t understand how the Oiler works. Is there enough capillary action to oil the sleeve bearing? I guess I was expecting a hole thru the sleeve that the shaft would be visible, but the sleeve bearing is continuous. The bearing on later GE fans seems to have been made of sintered bronze which is porous so the oil fed to the bearing could soak into the bearing to lubricate the motor shaft. I received the oil but as expected I bit too big. I will return or forward if you would like. Thank you again for sending! For some reason I can’t open your PMs. Could be my phone or this activity is not available to guests. Page processed in 0.2575 seconds (35% database + 65% PHP). 35 queries executed.